Pack size: 2 x 300ml bottles and 2 contact lens cases. Review Biotrue Duo Pack Good value, does what it says. Review Biotrue Duo Pack I love this solution. It does a great job of cleaning the lens and doesn't cause any stinging etc that I have experienced with other solutions. I would definitely recommend!! Review Biotrue Duo Pack Great product! 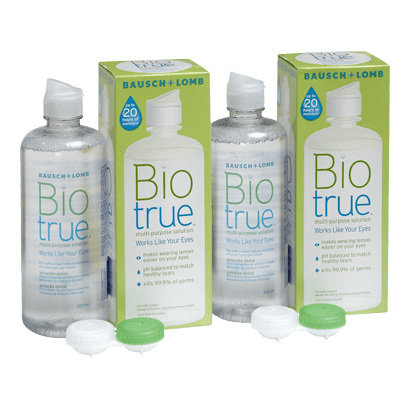 The Biotrue Duo Pack contains two bottles of Bausch & Lomb's multi-purpose soft lens solution. Combining two 300ml bottles, the pack is ideal for contact lens wearers looking for prolonged comfort. The Biotrue Duo Pack makes use of the thoroughly effective Biotrue cleansing solution that can make wearing lenses more comfortable, in a perfectly hydrated fashion, all day long. The specifically formulated solution works on the eyes in a perfectly balanced way, taking into account the natural hydration of the tear ducts in order to create comfortable hydration all day long. By basing the formula around the natural potency of the eyes natural fluids, a Biotrue Duo Pack of solution can be an excellent provider of comfort and eye-care. The innovative care solution is inspired by the natural alignment of the ocular properties found within the eye and can keep the beneficial proteins and fluids active and in perfect shape. The dual sizes found within the Biotrue Duo Pack can bring a confidence to all wearers of soft contact lenses whatever their day to day business happens to be. Healthy eyes and contact lenses can be combined whether at home, at work or travelling on holiday. The easy to use solution is a reliable and active way to keep eyes alert and problem-free.